MSN Display Picture Adder 1.0 is chat & instant messaging software developed by Free MSN Display Pictures. The MSN Display Picture adder allows you to quickly import any folder containing images into MSN Messenger as Display Pictures. Allows for quick and effortless adding of new MSN Display Pictures, such as downloaded picture packages. 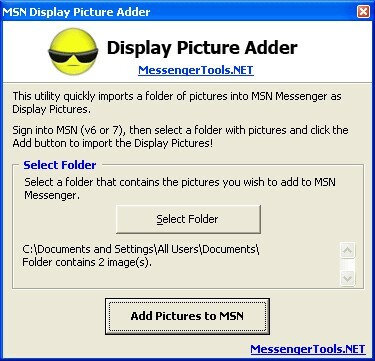 Once you have the pictures in a folder, you just point the Display Picture Adder to that folder and everything will be added to MSN as Display Pictures within a few seconds. This chat & instant messaging software is freeware, which means you can download and use MSN Display Picture Adder 1.0 absolutely free. There's no need to buy the product. MSN Display Picture Adder 1.0 supports English interface languages and works with Windows 98/XP/Vista. Latest MSN Display Picture Adder 1.0 does not contain any spyware and/or advertise modules, allowing installing it with no worries concerning valuable information loss. Our website has thoroughly tested communications product MSN Display Picture Adder 1.0, written the review and uploaded installation file (24K) to our fast server. Downloading MSN Display Picture Adder 1.0 will take several seconds if you use fast ADSL connection. Free New Year Display Pictures for MSN Messenger!